President Andrews congratulates graduates at the 2016 southern commencement ceremony. At National University, we believe that access to education is a fundamental right and we strive to support all students in achieving their educational goals. We are so fortunate and honored to have a University community that represents the great diversity of our nation, and as we celebrate Black History Month, this is a good time to consider the ways that we all benefit from learning about each other’s experiences as we work and grow together. Just one example of that is Dr. Saul Lankster II, who teaches criminal justice and law in the School of Professional Studies at NU’s Los Angeles campus – and whose own leadership in the Civil Rights Movement serves as an inspiration to us all. Dr. Lanskter is an Army veteran who became the first African-American to work in the Compton Fire Department. He later joined the Compton Police Department and was awarded a congressional gold medal for his role in the Civil Rights Movement. The work of Dr. Lankster allowed me to have an experience that transformed my own life. I attended high school in the South shortly after schools were forcibly integrated, and was one of the few white students to attend a predominantly African-American high school. When I graduated from Booker T. Washington High School, I left with more than just a diploma. I gained a new perspective that education can serve as a socioeconomic escalator and create opportunities for a more productive life. 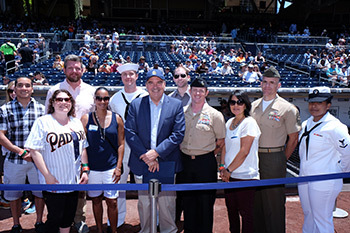 President Andrews pictured with recipients of National University’s Military Scholarship at Petco Park. During my 30-year career I have held a range of leadership roles in higher education and I have made diversity a constant priority so that students from all backgrounds can realize their full potential. National University also has a history of being committed to diversity and multiculturalism. The University’s programs, faculty, staff and students are a reflection of that commitment. 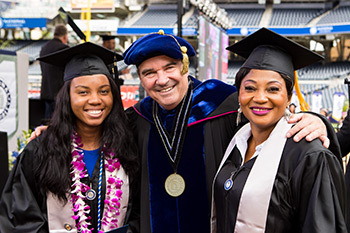 With that in mind, I invite you to read the National University 2020 Strategic Plan, which provides an overview of how we plan to fulfill our mission of creating the ultimate experience for all of our students guided by our values and priorities – and it includes a section on diversity and access. We are enriched not only by the extraordinary, diverse faculty and staff, but also by our unique student body that is comprised of dedicated adult learners. Representing a wide range of backgrounds, our students bring a rich mix of perspectives, and an abundance of cultural viewpoints that cultivate a climate of inclusion at our University. As National University continues to strive toward providing accessible, quality education to lifelong learners, we remain dedicated to inclusion and the well-being of our University community. 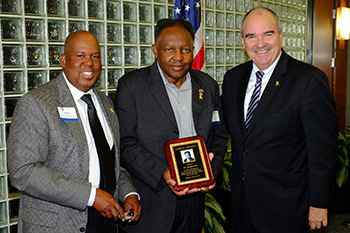 Douglas Barr (center) honored at NU’s 2016 Veterans’ Day Recognition Ceremony with President Andrews and Vernon Taylor, AVP of Regional Operations, Military & Veteran’s Programs.